Prime Minister Yıldırım said that Turkey took over the role of the rotating presidency of the APA from Cambodia since it is a country trying to take an active role in international organizations and global platforms. Prime Minister Binali Yıldırım called on Asian countries to collaborate in tackling terrorism and contributing to world peace to promote rapid development in a "highly dynamic, productive region." 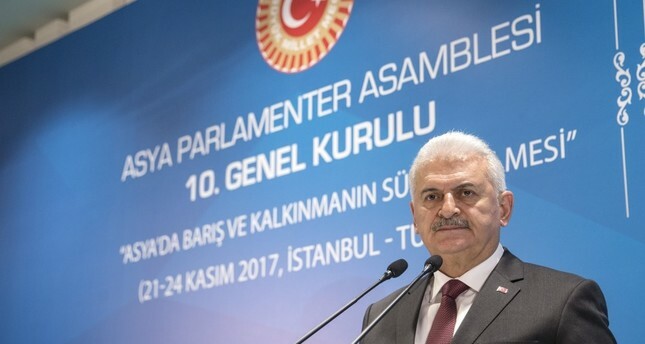 Speaking at a lunch held for the 10th General Meeting of the Asian Parliamentary Assembly (APA) in Istanbul yesterday, Prime Minister Yıldırım reminded Asian countries of their role in ensuring peace and ending conflicts in different parts of the world. "To live in peace and stability, to end conflicts between countries and to contribute to regional and global peace are our most important duties and responsibilities, and I want to express, once again, the importance of the Assembly of Asian Parliamentarians in this respect," Yıldırım said. Underlining that Turkey took over the role of the rotating presidency of the APA from Cambodia, Yıldırım said, "Turkey is a country trying to take an active role in international organizations and global platforms and to contribute to peace, stability and refinement reaching the most remote places on our planet." The prime minister also praised Asia's increasing role in the world arena. Yıldırım underscored that nobody should be surprised that the 21st century is called the "Asian century." "Asia is the largest continent in the world and also has the largest population. I think Asia is the region that is most open to the change and innovation that drives rapid development. Today, we are talking about a highly dynamic, productive region. In this context, it is important that the 10th Assembly of the Assembly of Asian Parliamentarians is being held within the framework of the continuation of peace and development in Asia," the prime minister said. Yıldırım added that the center of the world is shifting towards the East. "Today, China, India, Turkey, Vietnam, the Far East and Iran. … If we do not take into consideration the growth here, the world grows smaller. … The centers of wealth are now moving from the West to the East," he said. The prime minister stressed that Turkey sits in the middle of both sides as the center of the world shifts. Apart from its rotating presidency term for APA, Turkey has been forging even closer alliances with Asian countries than ever before. In recent years, Turkey has intensified its diplomatic and economic relations with Association of Southeast Asian Nations (ASEAN) member countries. "We aim to boost our relations in the region. We, Turkey, would like to be a member of ASEAN, not a dialogue partner. I would like to say that we are ready for this," President Recep Tayyip Erdoğan said in 2015 during his visit to the Indonesian capital Jakarta. Turkey became a signatory of the ASEAN Treaty of Amity and Cooperation in Southeast Asia on July 23, 2010, and thus, the foundation of sectoral cooperation was laid. Moreover, Turkey became a sectoral dialogue partner to ASEAN in August. Among Asian countries, China is undoubtedly one of the most significant countries for Turkey. Recently, new Turkish Ambassador to China Emin Önen told Daily Sabah: "Bilateral relations between the countries in terms of economy and politics are at a very good standing. Bilateral relations between the two countries have been improving since 2003." Asian ambassadors in Turkey are also pleased with Ankara's interest in Asia. The first resident Singaporean ambassador in Ankara, A. Selvarajah, appreciated Turkey's willingness to be a part of ASEAN. "We are delighted. We kindly welcome Turkey's efforts to become a sectoral dialogue partner," he said in August.